Gain visibility for your company or business by advertising on our website, electronic communications, or print publications, hosting a networking reception, or sponsoring an event. One of the many ways the Greater Reading Chamber of Commerce & Industry helps businesses succeed is in providing numerous opportunities to market to fellow businesses and consumers alike. From a myriad of publications to direct-mail programs to online venues, the Chamber's advertising opportunities and event sponsorships can be the perfect complement to your marketing program. Building your brand is important role in your company's overall marketing campaign and is effective in building brand awareness, gaining new clients and increasing overall visibility for your company. Sponsoring an event is a great way to increase your exposure in our community. View our online marketing sponsorship opportunities guide. Each month, the Chamber offers its members opportunities to network and make new business contacts at a variety of Networking Receptions. Sponsoring an event shines the spotlight on your business. You supply the food and beverage. The Chamber spreads the word by posting it to the Chamber calendar on our website, on our social media sites and in our enewsletters. We track registration, provide name badges and introduce our members to you as they arrive at the event. For more information on sponsorship opportunities, contact Bethany Kirkner at 610.898.7779. The business or organization must be a Chamber member to be eligible to sponsor a program or event. Each sponsor has the opportunity to sponsor an event for one year with the option to renew for an additional year provided no members have requested the opportunity to sponsor the event. If no new requests are received, it can remain with the original sponsor indefinitely. This policy gives members the ability to have access to events and programs that provide great branding opportunities. The Chamber's audience is a great place to focus your advertising attention, with a history of delivering excellent ROI on each dollar invested. We target your message to an audience of decision makers for B2B services and products as well as consumers with above average discretionary income. The Chamber's advertising options, which include web, electronic communications, print and video messaging, help you brand your products and services to a highly selective market at a really competitive price point. Consider making Chamber advertising part of your marketing plan today! View our online marketing opportunities guide. Advertising via the web and electronic communications is essential to include in your businesses advertising mix. Our website drives traffic from not only the Greater Reading area, but all around the world. Our focus is on serving Chamber investors and businesses of the area, visitors and residents of the community. Your message gains high visibility when connected with electronic advertising via Chamber Happenings Enews, Member-to-Member announcements, Espotlight, and Chamber Minute sponsorships. In addition, we have outstanding advertising packages available that combine print and web advertising! Rates range from $50 - $2,000. This comprehensive resource guide serves as a local business directory, a lifestyle resource guide and an economic development tool. County and city economic development professionals utilize this guide when promoting Greater Reading to site selectors, business prospects and corporate CEO's. Circulation is 8,000 with viewership to exceed 250,000 people as it will be placed in every hotel room throughout the Greater Reading area. A number of advertising opportunities are available from $175 to $4,445. 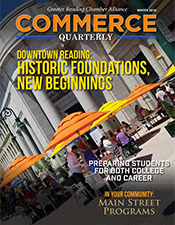 Commerce Quarterly reports on business trends, activities and news that impacts the Greater Reading, PA, region. It's designed to feature and promote business and entrepreneurship through content focusing on regional development, transportation issues, legislative advocacy, workforce needs, education and training issues and general industry news. Mailed to over 3,500 business and industry owners and C-level decision makers within the Greater Reading area. It is read and shared by more than 20,000 business decision makers throughout Berks County. A number of advertising opportunities are available from $300 to $1,700. For more information on advertising opportunities, please contact the Chamber at 610.376.6766. Advertising opportunities are available to current members in good standing. 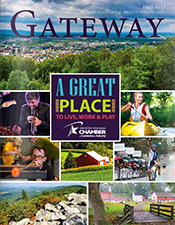 Non-member participation is only accepted in the Gateway Directory. All advertising is subject to approval from Greater Reading Chamber of Commerce and Industry regarding subject matter, form size, wording, illustrations, animation and typography. The publishers reserve the right to edit, reject or cancel any advertisement at any time, before or after placement. This policy includes, but is not limited to advertising on our website, etransmissions, Gateway directory, and monthly mailings.